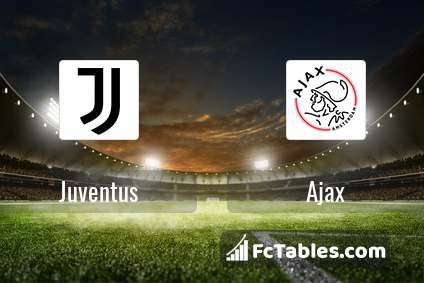 The match Juventus-Ajax Champions League will start today 19:00. Referee in the match will be Clement Turpin. Juventus takes place, which promoted to the European cups. In 5 last matches (league + cup) team gain 0 points. from 2 matches team have not been defeated. The best players Juventus in Champions League, who scored the most goals for the club: Cristiano Ronaldo 5 goals, Paulo Dybala 5 goals, Miralem Pjanic 2 goals. Players with the most assists: Cristiano Ronaldo 2 assists. Injured players Juventus: Giorgio Chiellini, Martin Caceres, Mario Mandzukic, Mattia Perin. Ajax takes place, which promoted to the European cups. Ajax in 5 last matches (league + cup) have collected0 points. from 2 matches team have not been defeated. To defend Juventus the most demanding players will be Dusan Tadic 9 goals, Hakim Ziyech 4 goals, Klaas Jan Huntelaar 4 goals, because this season they scored the most goals for Ajax of the entire composition. Players with the most assists: Dusan Tadic 7 assists, Hakim Ziyech 2 assists, Klaas Jan Huntelaar 2 assists. Nicolas Tagliafico. They will not be able to play in the game due to suspension. Direct matches: usually ended with winning of Juventus. 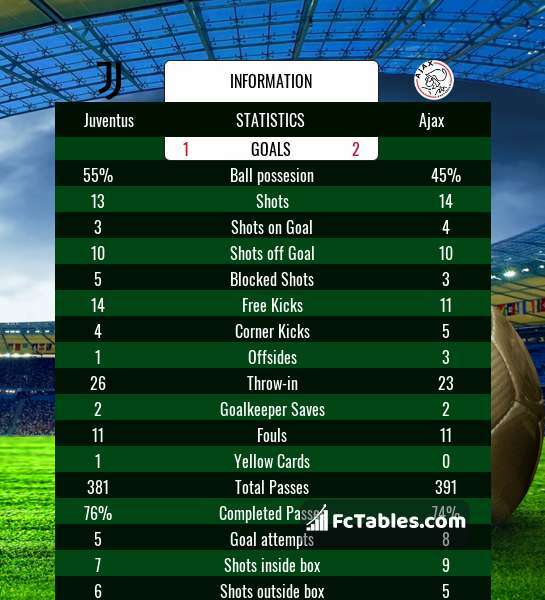 Balace of both teams games are: 3 won Juventus, 0 wins Ajax, 2 draws. In 1 matches the sum of the goals both teams was greater than 2.5 (Over 2.5). On the other hand, 2 matches teams scored more than 1.5 goals (Over 1.5). In 2 matches the both teams have shot at least one goal.